The May Festival will burst into life today (Friday May 27) with the launch of a packed programme of events and family fun that will run across the weekend. It will see actor and comedian Elaine C Smith, football pundit and broadcaster Pat Nevin and science whizz Marty Jopson, from the BBC's One Show, take to the stage in the Granite City. 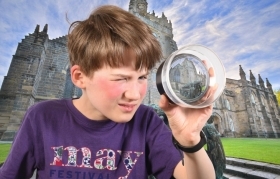 Organised by the University of Aberdeen the Festival is now in its fourth year and for 2016 boasts its largest programme ever with a wide spectrum of events ranging from arts, literature and music to science, food and sport. It is expected to attract thousands of visitors to the historic King’s College Campus – an appropriate setting to celebrate Scotland’s year of Innovation, Architecture and Design. In addition to a wide range of lectures and discussions, there will be drop-in family fun events and a dedicated Children’s programme to inspire young minds. The May Festival is supported by Total, Nexen, the Arts and Humanities Research Council, EventScotland and Aberdeen City Council and a host of other local sponsors, which allows many events to be offered free of charge or for low cost. Professor Sir Ian Diamond, Principal and Vice–Chancellor of the University of Aberdeen, said: “We are looking forward to an exciting weekend of events spanning literature, music, science, sport, film and visual culture. “The May Festival is now firmly established as a highlight in the region’s cultural calendar and the 2016 programme offers even greater diversity with the addition of a dedicated history and heritage strand. Other highlights of the weekend include a fresh produce market which will be held in Elphinstone Hall on Saturday (May 28) and biodiversity bonanza will run on Sunday. The King’s playing fields will be transformed into an outdoor stage of family fun with a bouncy castle, the wee green cinema in which people cycle to play the films and the bell tent with drop-in music workshops. For those with an interest in literature, the poet laureates of Belfast and Glasgow, Sinéad Morrissey and Jim Carruth, will come together on Sunday while London’s award-winning London's award-winning LGBT literary salon – Polari – will take place on campus. Music will also feature strongly with concerts from the renowned Choir of King’s College, Aberdeen and a mix of poetry and performance combining dedicated to Old-Aberdeen-born poet, Charles Hamilton Sorley, killed by a sniper at the Battle of Loos. Politics highlights include an ‘in conversation’ event with politics writer Dawn Foster and for Gaelic enthusiasts Ruairidh MacLean will read from An Creanaiche, his recent Highland-based, JFK-conspiracy novella for adult learners of the language. Aberdeen’s unique architectural heritage, how it is best protected and transmitted to future generations will be explored in a panel discussion. The Festival will welcome TED Speaker Dr Kate Stone, who was left fighting for life when she was charged at by a startled stag. She will discuss her road to recovery and how she was inspired to create her award winning company Novalia. Jo Robinson, VisitScotland Regional Director for Aberdeen City and Shire said: "Grand architecture is just one of the city's distinctive features to be celebrated as part of the May Festival's packed programme of 2016 Year of Innovation, Architecture and Design themed events." "Whether you choose to marvel at the idyllic King's College Campus, steeped in history and heritage or take a tour around the innovative state-of-the-art Rowett Institute for Nutrition and Health, I'm certain visitors and locals will once again be inspired be the wealth of things to see and do at this vibrant, exciting and educational festival."